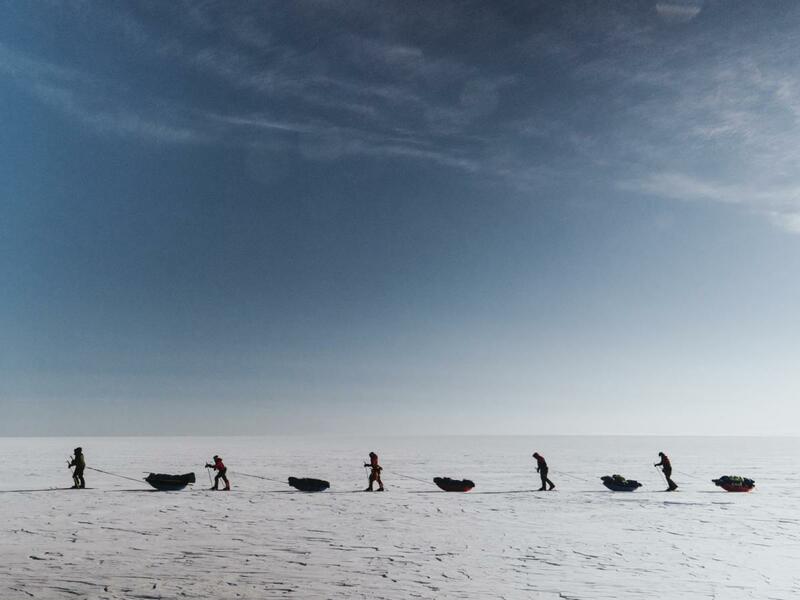 A new film, that follows young Antipodeans as they ski 560 kilometres to cross the Greenland icecap towing 60 kilogram sleds, will premiere at a prestigious New York festival. In Nansen’s Footsteps is being shown at The Explorers Club Polar Film Festival on the evening of 24 January 2019 (New York time). After the screening, it will be released online via the Antarctic Heritage Trust website, www.nzaht.org. Image from the 'In Nansen's footsteps' film is courtesy of the Antarctic Heritage Trust. The Explorers Club is a 114-year-old global network of explorers. Its famed membership has included Sir Edmund Hillary, Tensing Norgay, Neil Armstrong, Buzz Aldrin and Roald Amundsen. In Nansen’s Footsteps was made as part of the Antarctic Heritage Trust’s third Inspiring Explorers’ Expedition. The film was shot and directed by Australia’s Keith Parsons. He was one of four young people selected for the Antarctic Heritage Trust’s 2018 Inspiring Explorers’ Expedition, along with well-known Kiwis Brando Yelavich and Hollie Woodhouse and fellow Australian Bridget Kruger. Keith says having the film premiere at such the prestigious Explorers’ Club is an honour and reward for the enormous challenges he faced in making it. "This was a difficult project. The adventure was unfolding in real time, there were no second takes, no setups … it was all action. I constantly battled to keep the batteries warm and charged and the gear frost-free. It was an unforgettable experience though and I think the film has an authenticity borne out of those limitations." Led by Trust Executive Director Nigel Watson and guided by Ousland Polar Exploration master guide Bengt Rotmo, the expedition was in part supported by Australasian outdoors company Kathmandu. The expedition honoured Fridtjof Nansen. A Norwegian polar explorer and Nobel Peace Prize winner, Nansen completed the first crossing of Greenland in 1888. Nigel Watson says the film captures the highs and lows of the 28-day journey. As well as numerous storms, the team pushed on through illness and fatigue … even developing a taste for the pounds of butter they had to eat to maintain their energy levels. Antarctic Heritage Trust is a New Zealand-based not-for-profit with a vision of ‘Inspiring Explorers’. The Trust cares for the expedition bases and 20,000 artefacts left behind by early Antarctic explorers including Captain Robert Scott, Sir Ernest Shackleton, Sir Edmund Hillary and Carsten Borchgrevink. It also shares the legacy of exploration through outreach programmes and encourages the spirit of exploration through Inspiring Explorers’ Expeditions to engage and inspire a new generation. You can read more at nzaht.org. Keith Parsons (Director). A skilled photographer and videographer, Keith’s work has taken him all over the world. In between stints in London and Melbourne, he spent a year in sub-Saharan Africa, where he worked as a freelance visual journalist. Keith is an avid endurance runner, mountain biker and all-round outdoor enthusiast. Brando Yelavich. Brando was diagnosed with ADHD and dyslexia at a young age. Feeling despondent about his place in life, he made a bold decision to become the first person to circumnavigate the entire coastline of New Zealand on foot. An 8,700 kilometre journey that took him 600 days.Brando’s website can be found at wildboyadventures.com. Hollie Woodhouse. Hollie, aka The Adventurous Kiwi, has an unquenchable thirst for adventure that has taken her to the Sahara Desert and the Amazon Jungle, where she competed in endurance events covering over 200 km in five days. Back home, Hollie has competed in events including the Coast To Coast and Red Bull Defiance. Hollie is passionate about inspiring others to get into the great outdoors and give things a go. Read more at holliewoodhouse.com. Bridget Kruger. Bridget Kruger has worked as an outdoor instructor and adventure therapist all over the world. While working in Canada as a dog sled guide, she was run over by another sled and received a traumatic head injury. Bridget slept for nearly three months and had to regain her short-term memory, the ability to think coherently, as well as the ability to balance properly. Read more at adventuresofawildchild.com.